At this time of year many grandparents will be taking excited children off to the theatre, or village hall, for a seasonal rendition of one of the popular English ‘Panto’s. As a child I loved them, my own two looked forward to their annual trip to a big theatre in London, and now I’m enjoying taking the next generation. Usually filled with slapstick and bawdy humour, a leading prince played by a woman and a drag-queen playing the role of the pantomime Dame they are all pretty predictable. It’s a bit like ‘Marmite’ you either love or hate them. But what is it that keeps the Pantomime alive today? After all the plot is not terribly complicated. Biting an apple filled with poison, which has been given to her by a scheming and jealous step-mother, Snow White doesn’t die but falls into a deep sleep until a kiss filled with love revives her. Sleeping Beauty pricks her finger on a spindle loaded with bad magic by an evil-minded and jealous witch and falls asleep until her handsome prince finds her, and his loving kiss brings her back to life. In Beauty and the Beast it is Belle’s gentle nature and love that reverses a spell that had turned a prince into an angry beast and all his staff into tea-pot and candle sticks. Hm, so what’s the hidden message in the theme here? Not too difficult is it? Although I’m sure there is a massive potential for conversation – if not academic study – and probably already many a PhD literary thesis has been written on this very topic. I wish I had the time to look at the esoteric meaning behind these fairy stories myself. After all, all moral tales were historically acted out as entertainment. That’s how Shakespeare became famous. Actors brought news and royal intrigue to the towns and villages as well as entertaining the elite with their tales of love and woe. Yet hidden in the plot there was also a great deal of hidden spiritual meaning, for those who could see it. It doesn’t take much imagination for those of us who are interested in spiritual work to see that all the common life challenges are here in the banter of the panto. It is always possible for someone to entice us away from our purpose and they don’t have to be evil – but of course they might be jealous and scheming ! If we prick ourselves because we ‘disobey’ rules for our own safety perhaps we too fall asleep for a hundred years until the message of love (not necessarily in the form of a romantic kiss on the lips) brings us back to remembering who we really are. 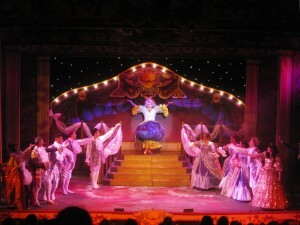 And we could look deeper and deeper … If you are going to a Christmas pantomime I hope you’ll have a fabulous time. I wonder if there will be any hidden messages you will pick up that perhaps you hadn’t thought about before? For me the message to my grandchildren will be that ‘love conquers all’. Happy New Year!